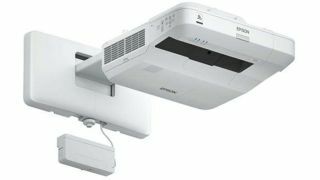 The What: Epson introduced several new display solutions for the rental and staging, corporate, education, and installation markets at InfoComm, including the BrightLink Pro 1470Ui and BrightLink 710Ui 3LCD interactive laser projectors. The What Else: Delivering 4,000 lumens of color brightness and 4,000 lumens of white brightness in full HD, the BrightLink Pro 1470Ui interactive laser display works on nearly any flat surface, turning it into a touch-enabled digital whiteboard. Users simply turn it on and begin writing, making it a suitable collaboration solution for modern meeting rooms. The 1470Ui offers a 100-inch display size to enhance and provide better readability for meeting rooms, and increase productivity and collaboration. The BrightLink 710Ui for classrooms is designed to converge technology, teachers, students, and their ideas into one digital experience, resulting in a collaborative learning environment. The new laser display is well suited for the type of large-format viewing that takes place in classrooms by delivering a bright, 100-inch image, up to 20,000 hours of virtually maintenance-free operation, and instant on/off. Offering 4,000 lumens of color and 4,000 lumens of white brightness with a Full HD WUXGA display for crisp images, built-in pen/touch interactivity, and multi-platform connectivity options, the 710Ui is engineered with the modern, collaborative classroom in mind. The BrightLink 710Ui also works with popular software used in classrooms today and includes a one-year subscription to SMART Notebook. The Bottom Line: With its 3LCD panels with an inorganic phosphor wheel, Epson continues to build on laser features to connect people and technology with solutions for creative ideas, displays, and collaboration across a variety of sectors, including corporate spaces, educational institutions, and anywhere that long life, minimal maintenance, and low cost of operation are significant. The BrightLink Pro 1470Ui and BrightLink 710Ui will be available in November 2017.